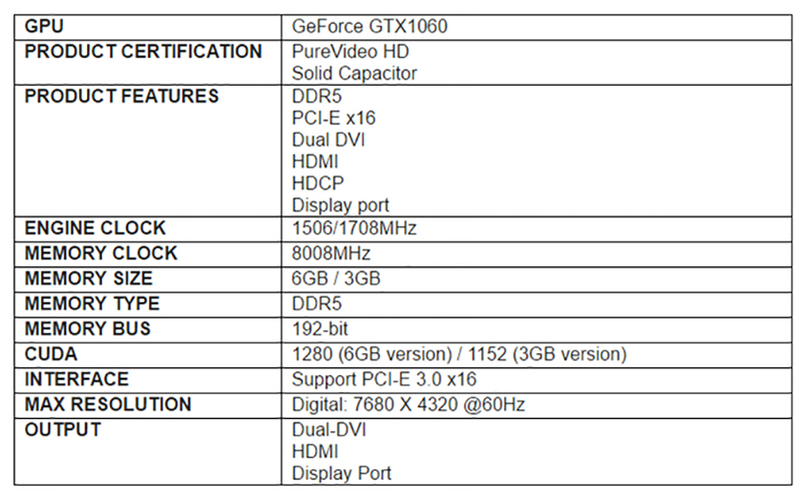 Taipeh, 24 October 2016 – BIOSTAR is proud to announce the availability of the newest addition to its VGA product series with the new BIOSTAR GTX 1060 graphics card, available in both 6GB and 3GB variety, the BIOSTAR GTX 1060 graphics card bring affordable VR and high-performance gaming closer to the masses making it an ideal choice to be your first VR gaming GPU. The BIOSTAR GeForce GTX 1060 graphics card features the GP106 GPU sporting 1280 CUDA cores and runs with a base core clock of 1506Mhz. Featuring GPU Boost 3.0, the BIOSTAR GeForce GTX 1060 6GB can run up to 1708Mhz and features 6GB of GDDR5 video memory connected a 192-bit bus interface. The BIOSTAR GeForce GTX 1060 3GB version features 1152 CUDA cores running at 1506Mhz and has a boost frequency of 1708Mhz also. The 3GB of GDDR5 memory also sports a 192-bit interface bandwidth. Both cards require only a single 6-pin power connector. Designed for the latest generation of games and gaming experiences, the GeForce GTX 1060 takes gaming to the next level with performance and efficiency that beats everything before it featuring the all-new Pascal GPU architecture fabricatedon the 16nm FinFET process technology. 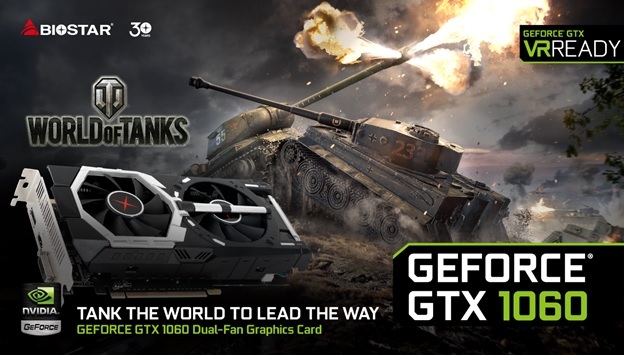 The new BIOSTAR GeForce GTX 1060 is cooled by the unique BIOSTAR Tank Dual Fan cooler inspired and design in cooperation with World of Tanks to keep the card running at optimal temperatures while keeping noise levels to a minimum. The new dual-fan cooler features a gaming tank-shaped stylish design exuding an aggressive feel to the card while keeping it cool. The GTX 1060 6GB has a rated TDP of only 120W and the 3GB has 115w TDP while still delivering three times the performance of previous graphics card from earlier generation. NVIDIA leverages new technologies for this generation of graphics card and allows players to fully immerse themselves while providing higher performance for existing games and serving as a launch pad for new ones. Technology like Simultaneous Multi-Projection, ANSEL and Fast Sync allow gamers to fully maximize their gaming experience but also enjoy a whole new level of realism with VR. The BIOSTAR GeForce GTX 1060 6GB will have an MSRP of $289 and the 3GB version at $239.